Taming horses can be quite hard at first and you can end up wasting materials. I recommend thoroughly reading this guide before trying to tame a horse. 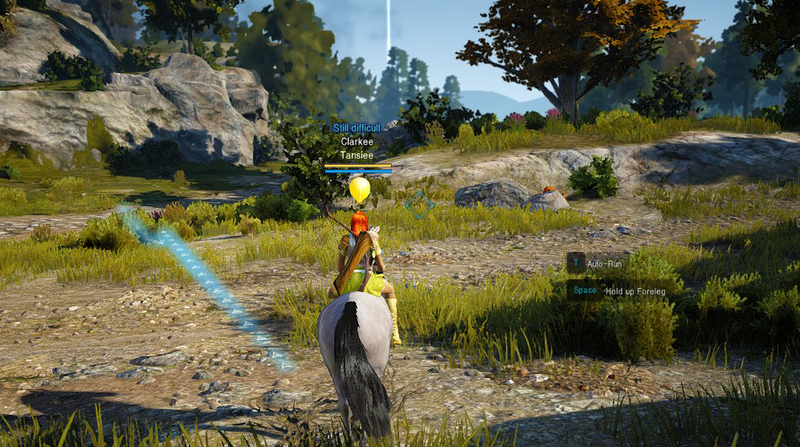 You can also follow this quest line which will teach you how to tame horses and give you some rewards for completing them: Have You Ever… Tamed a Horse? However, you will need beginner 6 training to start so ride around on your donkey/horse to level it and gain some EXP in training if you don’t meet the requirements. To begin with you will need to purchase some “Capturing Rope” and craft “Lump of Raw Sugar”. 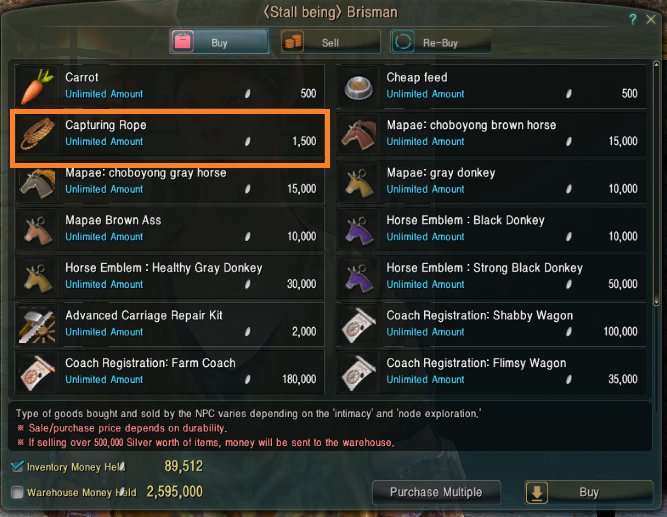 To purchase the capturing rope go to the stable hand, then the shop to purchase one for 1,500 silver. I recommend buying at least 3 of these for your first try. To craft the lump of raw sugar you will need to go to a food merchant (cooking merchant) and buy the ingredients for the recipe. The recipe is 10 Raw Sugar and 1 Spring Water for Cooking to make 1 Lump of Raw Sugar. I recommend crafting at least 2 lumps of raw sugar per horse, so you will need to buy 20 raw sugar and 2 spring water for cooking. This should cost 4,060 so in total. 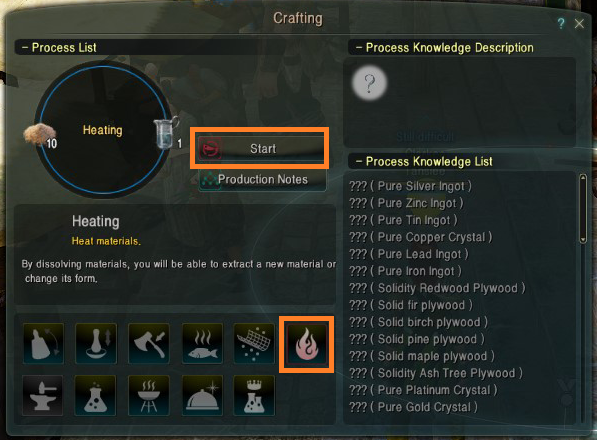 Once you have the ingredients press “L” to open the crafting window and select “Heat”. 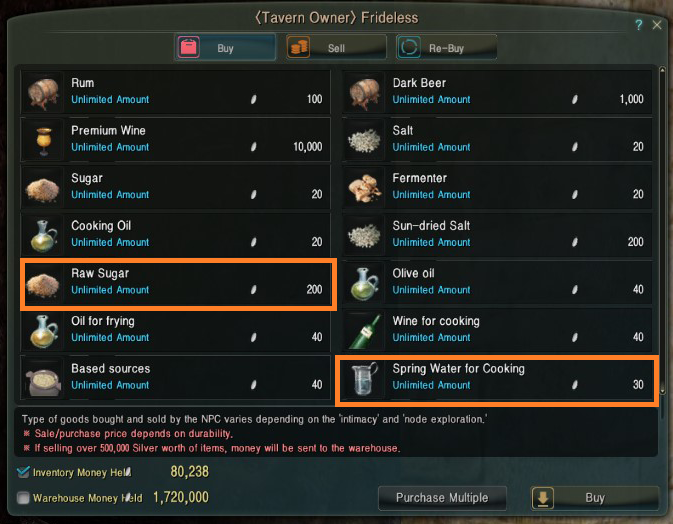 Right-click the ingredients you have bought and click “Start”. 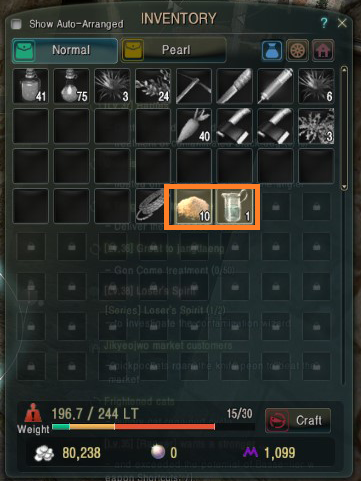 Now you should have all the materials you need. Check out the BDFoundry Interactive Map for horse spawn locations. Select “Wild horses” from the drop down box to display all of the known spawn locations. If the locations shown on the map are empty then the horses may have already been tamed or killed by other players. You can try another location or come back in an hour and they should re-spawn. The highest tier horse you can tame is a tier 5 but I would recommend only attempting a tier 5 if you know what you’re doing and have at least Apprentice training life skill. 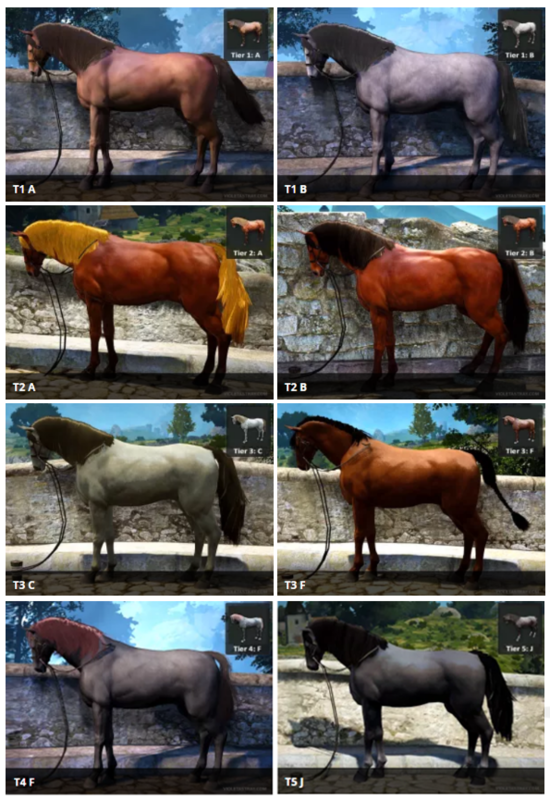 Below is an image showing all the horses you can tame. When you see one of these in the wild you can work out what tier it is just by its appearance. Once you have found a horse open up your inventory and right-click the capturing rope to use it. Aim the rope and left-click to throw it over the horse. A bar will show up on the right and you need to press the space bar and land it in the red area of the bar. You cannot let the bar go up and down, you only have one chance to land it in the area. If you miss the area or don’t press the space bar you will lose the capturing rope. If you manage to get the rope over the horses head you will now be able to start moving towards the horse using W,A,S and D. If you see the horse stand on it’s hind legs, like in the screenshot below, you will need to press the space bar to start the mini-game. If you do not press space bar in time you will lose the horse and have to try again. 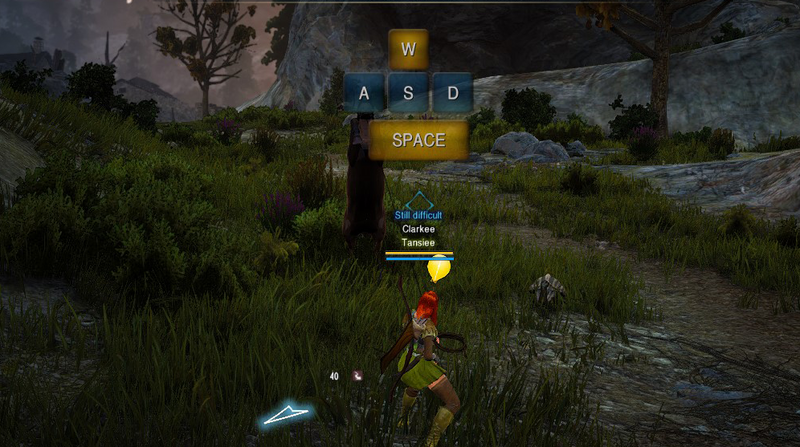 To win the mini-game you will need to repeatedly press the space bar for 10 seconds. When the 10 seconds are over you need to make sure it is on the “winning” side of the bar at the top. 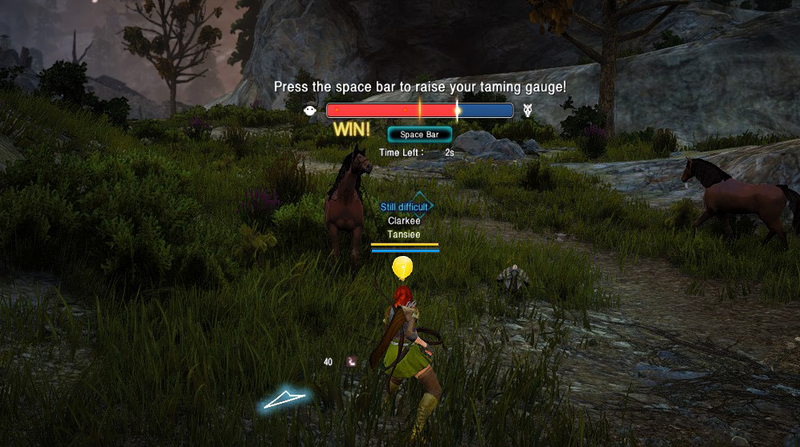 If you win the mini-game you will be able to move closer until the horse stands on it’s hind legs again and you have to repeat the mini-game. When you get close enough to the horse you will be able to ride or use an item. This is where you use the raw sugar lumps we made. Press “F1” then right click the raw sugar lumps in your bag to feed them to the horse. Next press “R” to ride the horse. If you are unsuccessful you will be thrown off and will have to start again. If you are successful you will need to ride the horse to the stable hand. When you get to the stable hand get off the horse and go to the “Stable” section. 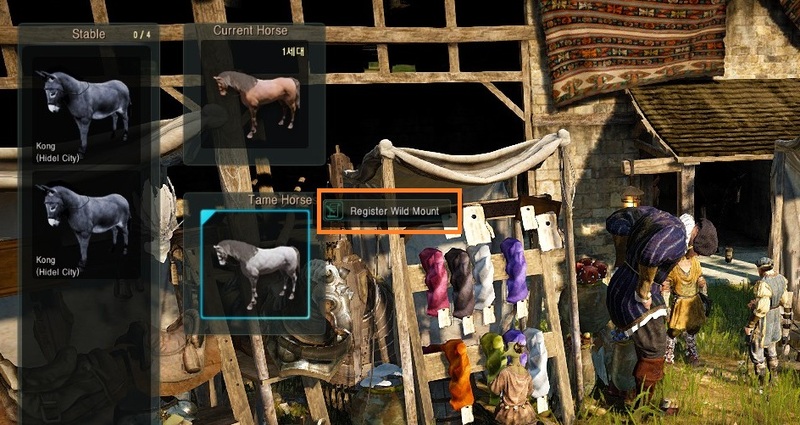 Here you can register the horse by pressing “Register Wild Mount” then entering the horses name. Unfortunately you will only know the gender of the horse after you have named it.